I felt no discernable reduction in power from the 2.0-liter I4 because the new 6-speed manual is so well suited to it. Shifts are short and direct and the clutch light. I took this on an afternoon spin around the Holy Hill area over winding side roads and with the top down. What a joy, smelling the apples, barley and livestock as the car flitted through the early autumn sun. Handling is quick, shifts crisp and the seats pleasantly snug to hold you in place as you zip along the roads effortlessly snapping off apexes at each corner. Waxing poetic? 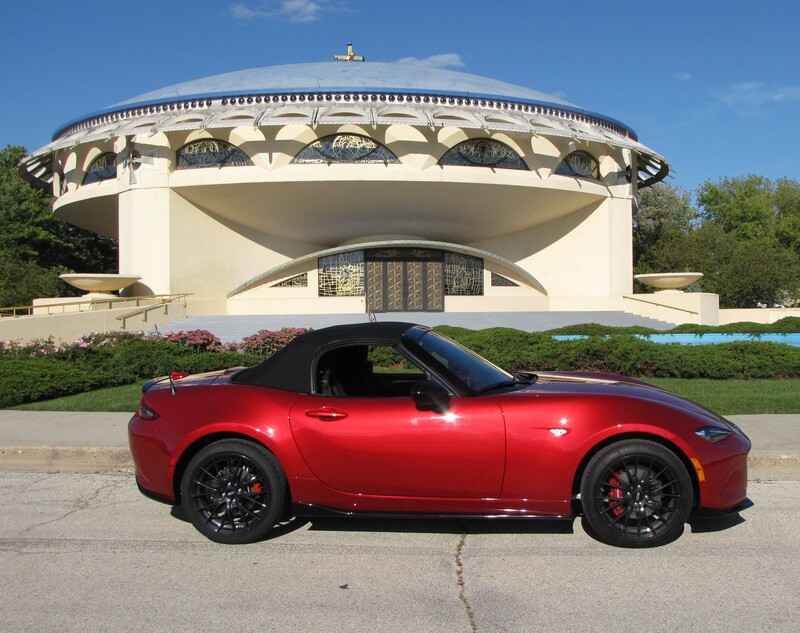 Well, Miata makes you feel that way. But I admit, the short wheelbase is a bit stiff on city streets. I never felt jolted, but you notice the craters that pass for potholes in the Bayview area. The dark metallic red test car, the mid-level Club model, featured a black cloth top, which also let in more wind noise than some previous models I’ve driven. I’ve also had the previous power hard-top version which is much quieter and for us 50+ drivers, the quieter is likely preferred. Top-down there is a bit of wind in the cockpit, but not much. Noise is not that much greater either. Braking in the test car was superb due to a $3,400 option package that added red Brembo brake calipers, fancy BBS wheels, plus some side sill and rear bumper trim. I’d probably save the money, but it looks good and the brakes perform well. Inside the Miata remains tight quarters, but you expect that. Us short drivers have always appreciated its snug fit, but Mazda did manage to get another notch in the seat back recline position to help tall drivers stretch out a bit more. Headroom remains good in the convertible, but then you are sitting mighty low here. One difference I noticed from inside is the new hood’s styling creates the illusion that you’re driving a Corvette. Not sure if that’s intentional, but insinuating more muscle probably won’t hurt any driver’s ego. The tall rounded fenders and wider wheel flairs create the effect of sitting deep within a muscular car. Top up and it still looks good! 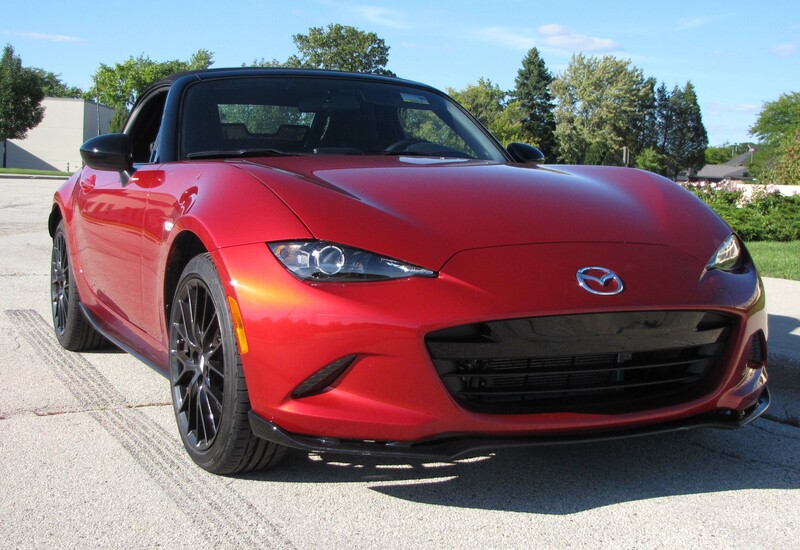 Of course the exhaust note, while sweet, quickly assures the driver this is a sports car, not a muscle missile. There are three simple gauges in front of the driver, three round air vents and oddly one rectangular one. This is similar to the Mazda3 and CX-3 dash, but pleasant. It includes a good-sized navigation/radio screen that extends out of the dash’s top for clear visibility. This one also had some carbon fiber-like trim on the door armrests, brushed metal look on the steering wheel hub and soft-touch dash and buttons. 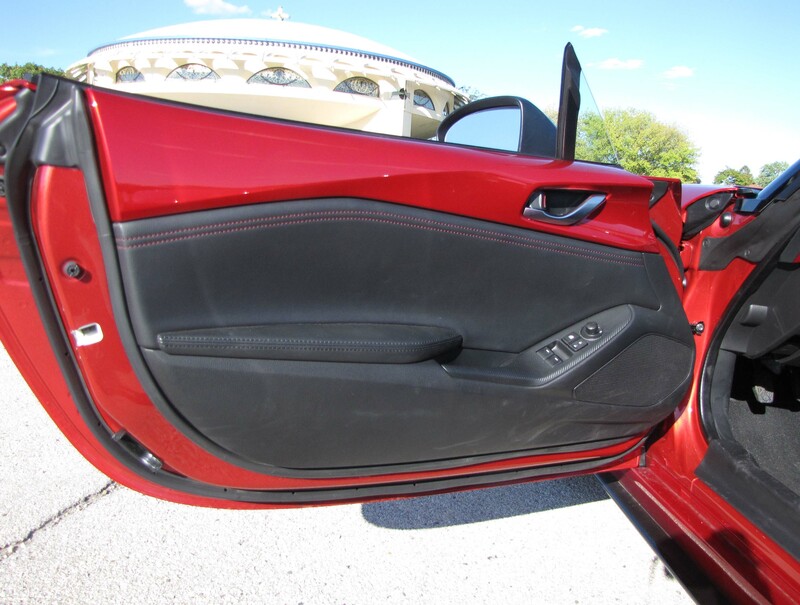 This one had black cloth seats with red stitching and the door panel tops matched the car’s “Soul Red” exterior. Moving up to the Grand Touring model gets you leather seats. Push button start is standard on the Club model and the dash features three climate control knobs and three electrical hookups. That’s great for plugging in the iPod, etc. But the radio sounds good here with six speakers already, including a couple in the headrests so you can better hear tunes while the top is dropped. 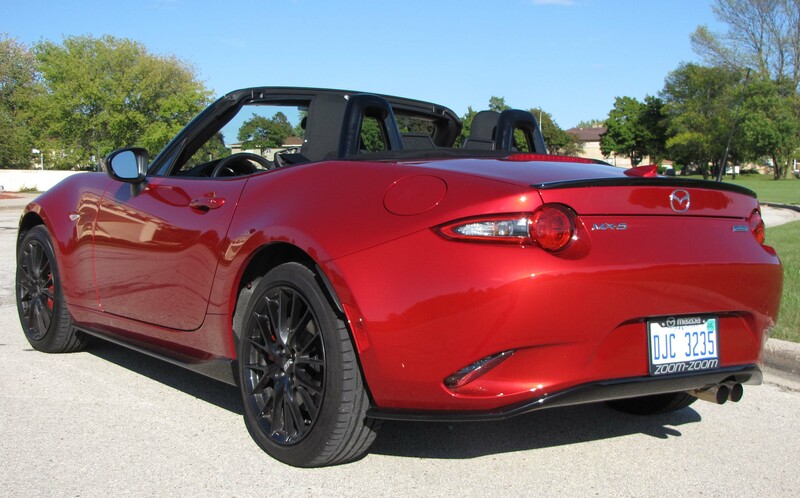 Speaking of which, Miata’s standard top continues to be manual. This is simple to lower. Just press a button and pull it back. If you have reasonable muscle tone you can flip it back all the way. You might need to kneel in the seat to snap it down tight behind the windscreen. It’s opened by pressing a lever behind and between the seats, a bit awkward if you’re sitting, but again kneeling in the seat makes it simple. Pull it back up and latch it. Easy! There’s a manual tilt wheel, no telescoping, and there are a couple storage boxes behind the seats and between, but behind, them. Cargo room is fine for a couple overnight bags or one moderate-sized suitcase and a few small items. Sun visors are tiny and do not flip to the side to help block side sun. Get a good pair of wraparound sunglasses if you don’t mind looking like a senior citizen! Fuel economy has improved considerably, due to the weight loss and retuned engine that burns premium gasoline. The EPA rates this at 27 mpg city and 34 highway. I managed 36.5 mpg in about 70% highway driving. Then there’s the good news of pricing. Despite the car being redesigned it remains similarly priced to the 2015 model. 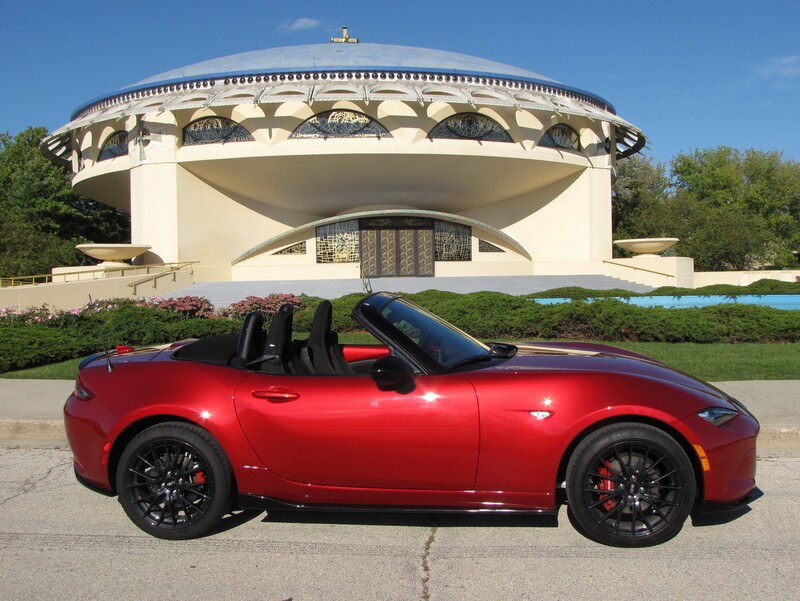 The Club model lists at $29,470, including delivery. With the option package the test car hit $32,780, still below the average cost of a new car today. The base Sport model lists at $25,735 and has the 6-speed manual. Moving to an automatic version bumps the price to $27,215. Jumping to the Grand Touring with an automatic moves the price to $32,090, but your gas mileage is even better at 27 city and 36 mpg highway. Yes, automatics now get better fuel economy than manuals, thanks to all those microprocessors to help them shift at exactly the right moment. But then that takes the fun away and this is a driver’s car start to finish. Grow a pair and stick with the manual. 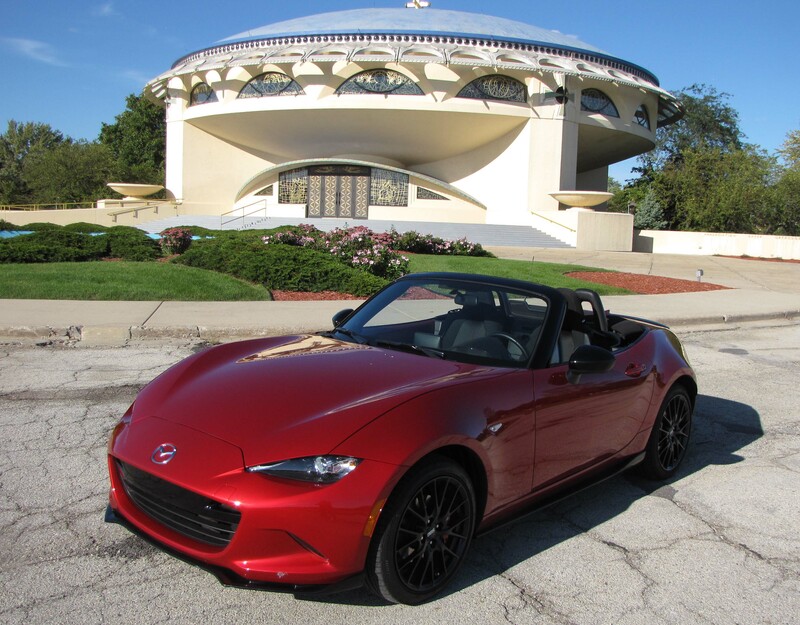 Miata remains the iconic sports car, now lighter and more fulfilling! Hits: Iconic sports car looks, handling and feel. Epitome of simple and fun with manual 6-speed gearbox. Restyling gives it a more muscular hood and wheel flairs, manual top folds simply, seats pleasantly snug, fuel economy is good and pricing remains affordable. Misses: Wind noise was substantial even with top up, no side sun visor and drinks premium fuel.